Now honestly, who among us doesn't like to spend thousands of dollars to stand in line all day wasting valuable park time and losing that special park mojo that comes when you're on a roll? Enter Lines and TouringPlans.com *ding*. 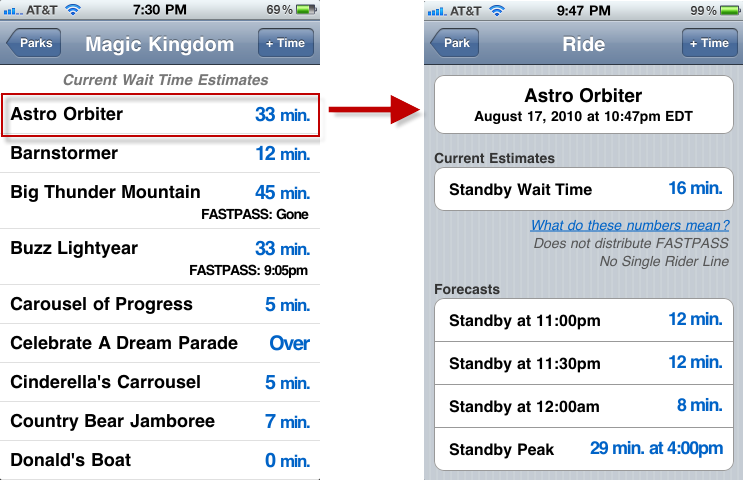 Lines is a very easy to use app for ride queue estimation. Now I don't want to make Lines sound like it is the only app out there that handles wait times. There are many and I have used a number of them on my last several trips. Some were good, some weren't, and it all depends on the honesty of the end users to make sure everything is on the up and up. 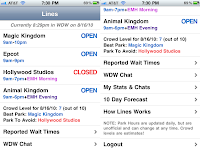 Unlike other apps of its ilk, Lines does not depend upon the participation of its users to update the wait times. It combines user input with years of historical data to predict waits. The Lines app itself is free, however the service is part of a subscription to www.TouringPlans.com. Seeing as I was a member of TouringPlans.com before Lines existed, this isn't a problem for me. So to tell you about Lines, I need to back up and quickly tell you about TouringPlans.com. TouringPlans.com is a site dedicated to providing trip planning resources, crowd calendars, ticket calculators, and massive amounts of data on the parks and resorts. This is all done to save you money, time and frustration. These good people have been writing one of the best books about the parks since 1985: The Unofficial Guide Walt Disney World 2010 (Unofficial Guides) *ding*. It offers tips on hotels, restaurants, activities and plenty of examples of ways to make your stay at Walt Disney World even better. So back to Lines. Lines, like many other apps, tends to be intuitive. The home screen (after logging in) immediately shows park operating hours, if a park has extra magic hours and the crowd estimates. The below image is the home page scrolled from top to bottom. Getting more information on any of the listed items is as easy as tapping one of the selections. When we select the Magic Kingdom, for example, a list of all the attractions comes up with current wait times and FASTPASS times displayed. (Continue to scroll for complete list of attractions.) 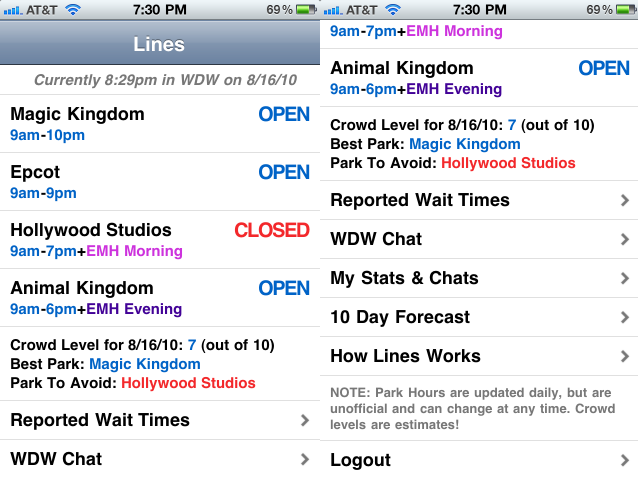 If you select a particular attraction, detailed information about the wait times and forecasts of future times are shown. To report a time, look to the top right hand corner to the + Time button, select the ride you want to submit and then enter the time on the standard scroll wheel that we all know so well from Apple. This is a fun app that does exactly as advertised. When I used it on my last trips in October 2009 and April 2010, it was right on time. Also an innovative feature is the built-in chat. 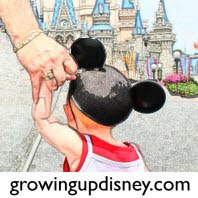 You can post a question and get responses from other knowledgeable Disney goers. Other information from TouringPlans.com is available to you through the Lines app, such as crowd calendar, park hours, and refurbishments. Don’t have an iPhone? You’re not left out of the fun. Lines is also available for Android, Palm Pre/Pixi, and BlackBerry phones. Have you used Lines? What did you think? Hey Ashley thanks, I forgot about the web version. When they were in beta testing that is how I used it. They have really done a fantastic job of keeping it simple and not cluttering up the screens with confusing information. Thanks for reading and commenting! I am passing this on to Bill for our upcoming trip! Thanks for the review.